X-Force #1 With two trading card in bag, Never open, NM+ 9.8, CANADA PRINT! 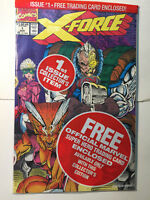 X-FORCE #1 : SPECIAL EDITION OF 1ST APPEARANCE HOTTEST MUTANT TEAM NM!! X-Force (1991) #1 NM- 9.2 Marvel Sealed w/ Deadpool Trading Card; $4 Flat-Rate!